Who doesn’t enjoy a great brunch? 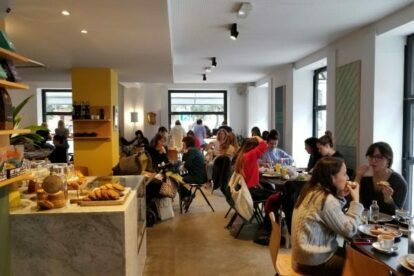 Federal Café in Madrid is a must-stop spot for those seeking a delicious and affordable brunch in this vibrant city. Federal offers, in my opinion, the best eggs Benedict (spinach, bacon or salmon) in Madrid. In addition to a variety of egg dishes, Federal prepares waffles, pancakes, toasts, among other classic brunch options. The menu is easy to follow and offers a quick guide on ingredients and allergies. Their iced coffee is also great! Seating is offered inside as well as outside in a small plaza. After 13:00 during the week, and after 16:00 on Saturday, Federal also has a lunch/dinner menu. Another great point is that Federal has two locations! One right by Plaza Mayor just southwest of the center and the other one in the northwest university neighborhood. I recommend checking out the location right next to Plaza Mayor. There is nothing like finishing a great meal and taking a stroll through the biggest open plaza in Madrid. Another word of advice is to try and get there early! I don’t believe I have ever sat down to a table immediately, but have no worries, as the wait is usually no longer than 20 minutes or so. If needed, Federal is also a great spot to get some work done. Federal offers a communal table for those with laptops who need some time to work.